He's small, fluffy, and absolutely adorable: Hamtarou is one perfect little hamster! After moving to a new house with his owner, 5th grader HirokoHaruna, Hamtarou discovers other hamsters and quickly makes friends. The group of hamster explorers call themselves the Ham-Hams, and there's nowhere they won't go. The Ham-Hams go on crazy adventures all around the city while their owners are away, visiting everything from plays to magical lands of candy. Meanwhile, the humans face their own dramas..
Hamtarou meets a huge cast of different personalities, gets himself into—and out of—some pretty tight spots, and even helps Hiroko and her friends out more than once. Through it all, he never stops being unbearably cute. It's Hamtarou time! 104 out of almost 300 episodes of Tottoko Hamtarou were translated and broadcast on Cartoon Network in the US and Fox Kids in Europe. The series received the Tokyo Anime Award in 2002. Alternative version: Tottoko Hamtarou: Anime Dechu! Oh, my childhood. Where did you go? Let me begin my review by acknowledging (and hopefully resisting) a little bit of bias. Hamtaro was the very first anime series I ever saw. I started watching it when it was still airing on Cartoon Network in 2001; I was only three years old, so I suppose it's understandable that I fell in love with it. I don't feel like I should list myself as having watched any episodes, since I don't remember any of them in particular, but for many years, Hamtaro was my life. I would try to get up early every morning so I could watch it in the 6:30 slot before preschool. I only just discovered, today actually, that after the dub ended in 2002, the series kept running in its native Japan until 2006, and I am here to tell you that if I had known that, I would have gotten into subbed anime much sooner. Hamtaro, as a whole, is a beautiful series, in so many different ways. The story and character get a perfect ten from me for obvious reasons. Hamtaro brought out liveliness, kindness, adventure, and even childlike romance, all things a children's series tries to have, and it blew those topics out of the water. Not only is the title character courageous and adventurous, he's a bit naive, which makes him even more adorable. Art and sound...not quite so perfect, but understandable given the target audience. Children are going to love this series whether it looks like a hundred-million-dollar budget movie or not. Enjoyment? I believe I already acknowledged that area. The overall score is what it should be, in my opinion. Hamtaro is what every child longs for in a television series, and Ritsuko Kawai delivered. You don't see many anime series that live on ten years after they end, but yet, here we are today. At the time of writing, I am already making plans to get back into this series almost fifteen years after the last time I saw it. Tottoko Hamtarou, you gave me my childhood. Now, I feel like I'm right back in it, and it was the best time of my life. The story of friendship,honor,glory and teamwork. This series is a great anime that doesn't take itself too seriously but can still trigger emotions when it needs to. There's everything from comedy to adventure to randomness everything an anime needs hamtaro has, except plot. It has more of an episodic theme with "filler" like episodes instead of a main plot but that doesn't harm the shows quality in any way. The soundtrack this show gives is a straight 10/10 . I have yet to find a song I didn't like especially the ending which is a great uplifting song filled with positivity. This may be my nostalgia talking but I HIGHLY recommend this anime to newcomers and vets from any age range you won't be left disappointed! Ahh, Hamtaro. Where do I begin? The epic tales of little hamsters and their trials and tribulations in a big world. This series is absolutely irresistible. I first started watching it with my little sister because of the cute hamsters but soon got pulled into the simple, childish world. Bear in mind that this is a series primarily aimed towards children and is being rated as such. However, I found the series enjoyable on many levels, from the rivalries between the hamsters for their loves and the various friendships and relationships that invariably develop with such a large cast of characters. The animation and music are both top notch, the Hamsters are beautifully drawn and fit nicely into a colorful suburban world. The music is fun and silly and you'll find yourself humming along. It's all very upbeat, bright and happy. 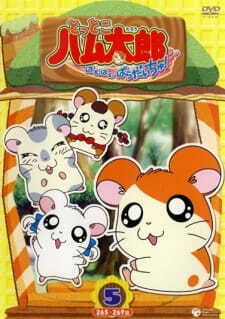 Story wise, it's a slice of life anime, concerning both the hamsters and their owners; the children of the neighborhood. It is episodic in nature but never repetitive or slow. Each episode jumps back and forth between the main character, Hamtaro, and his owner, often going through very similar situations on different scales. There are always new adventures, new problems to solve, misunderstandings to clear and new hamsters to meet. Every episode oozes charm and offers not only plenty of slapstick humor but also that of a more subtle kind. You can see how each hamster's personality reflects their owners, and get glimpses into their lives. Boss blushes furiously every time his crush looks in his direction and explodes in anger whenever anyone else gives her any attention. Another two hamsters have a permanent rivalry over their shared beloved. Their antics kept me chuckling every episode. With such a huge and varied cast of characters, someone is sure to catch your eye. Each one bursts with life and fun. So, in summary, it's a highly enjoyable series, great for watching with a younger sibling or child as a safe introduction to the world of anime. Or even just for laughs and eye candy. It's not moralistic, but has plenty of good messages; friendship, kindness, believing in yourself. It's upbeat, fun and never petty or mean as many children's shows are these days. Highly recommended, check it out! What can I say? I'm a fan boy! But my review is honestly what I think this series deserves--it is a perfect mix of everything anime is suppose to be. There is a bit of everything from time to time: romance, action, humour, suspense, seriousness, etc. The series is most enjoyable in the original form (Tottoko Hamutaro) as I find the voice acting much better, and the sound EXTREMELY better. It has, by far, the BEST OST soundtrack of any anime I've ever heard, surpassing the likes of One Piece by a mile. Where it does fall short, unfortunately, is the story. At times the childishness of the series really comes through and that will ruin it for some people. As well, some things just don't make much sense. But if you love furry little creatures, and love it even more when they're personified, then you really need to start watching Hamtaro / Tottoko Hamutaro. Most of us drop shows that we don't like or grow tired of, but have you ever wondered which shows have the highest number of droppers, and which ones have the highest drop rates? We pulled the data from MAL, so we can see which shows MAL users gave a chance and didn't like!